August 2010 - Extended Stay Sprecial!!! Stay three or more nights and receive 15% discount. New reservatons only. September 2010 - Midweek Christmas Museum Special (Sunday - Thursday nights). Stay two nights and receive two passes for the National Christmas Center, a $22.00 Value!! RESERVATIONS ONLINE CLICK HERE. 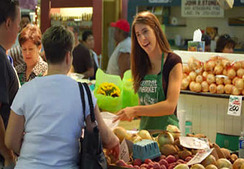 August and September are great times to explore and enjoy the locally grown produce in the area. The farmer's markets and many local produce stands are now open flourishing with locally grown fruits and vegetables. A favorite of the After Eight Bed & Breakfast guests, it is only 10 minutes away. Don't miss the old time Hardware Store across the highway with the two old gas pumps outside. Roots Farmer's Market Every Tuesday you can explore five connnecting buildings with a variety of stands. There is also an outside flea market, animal and plant auction and many outside vendors. 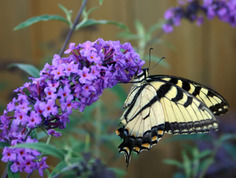 The butterflies are loving, but what else, but the Butterfly Bushes, they are still in full bloom in several places around the yard along with the Russian Sage and Black Eyed Susans. Don't miss out on our very friendly and plentiful rabbits this year, hopping all around the yard. Hope to see you again soon. The gazebo now is screened in, while the project is still incomplete, there is a glider and a picnic table with seats all around, a great place to relax and read a book. Check out behind the barn for two benches that were relocated in the shade of our nut trees.